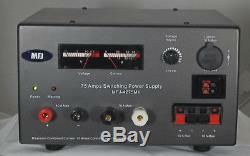 MFJ-4275MV Heavy Duty 75A Switching Power Supply with Adj. MFJs heavy duty 75 Amp switching power supply is excellent for powering your HF mobile amplifier or your HF and VHF/UHF rigs and accessories. 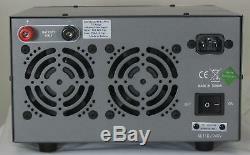 Its great for Ameritrons ALS-500M Solid State Mobile HF Amplifier and others with a power requirement of up to 75 Amps. 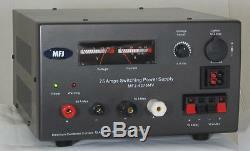 MFJ-4275MV delivers 75 amps maximum and 70 amps continuously without even flexing its muscles. Plugs into any 110 VAC wall outlet. Its highly regulated with load regulation better than 1%. Ripple voltage is less than 12 mV peak-to-peak at rated load. MFJs exclusive HashSQUASH Filtering System eliminates RF hash that plagues other manufacturers switching power supplies. Your MFJ-4275MV has Short-Circuit, Overload and Over-Temperature protection systems. Also has an auto restart after a fault. Has power on and Fault LED indicators. You get front panel adjustable voltage from 4.0 to 16 VDC. Front-panel meters with backlight let you monitor voltage and current simultaneously. Attractive front panel features several options for connecting your gear: 1 pair of 5-way binding posts, 2 pairs of Anderson PowerPoles, 1 pair of high-current 5-way binding posts, a cigarette socket for mobile accessories, and two pairs of quick connects. Battery charging feature can be used to charge your car battery. Whisper quiet fan speed increases as load current increases and keeps components cool and protected. Measures 9 ¾" x 5 ½" x 9 ½. It weighs just 10.5 lbs. Which is light enough to carry on DXpeditions, camping and vacations. No more hauling around big, bulky conventional power supplies that can give you a hernia! GigaParts ships from multiple locations across the USA, so a portion of your order may come from two different warehouses. Modified radios do not qualify for direct replacement unless GigaParts performed the modification. Is a full service computer and amateur radio store. Our PC department stocks the latest components for upgrading your PC, building your own PC, or having us build one for you. Our Radio department features the latest products from manufacturers such as Alinco, Icom, Kenwood®, Yaesu, MFJ, Diamond, and many more. Whether you're a DX'er looking for the latest HF rig or a soon-to-be-HAM looking for study materials and a two-meter handie talkie, we have what you need! We look forward to adding you to our long list of satisfied customers. You may also be interested in.. The item "MFJ-4275MV Heavy Duty 75A Switching Power Supply with Adj. Voltage and Meters" is in sale since Monday, October 19, 2015. This item is in the category "Consumer Electronics\Radio Communication\Ham, Amateur Radio\Other Ham Radio Equipment". The seller is "gigaparts" and is located in United States.